You ask “Should I sell my home on Maui myself? It’s a question thousands of homeowners ponder each year, and the majority are motivated by a perception that the For Sale By Owner (FSBO) process saves sellers time and money. Sadly this couldn’t farther from the truth. Unfortunately, the do-it-yourself approach doesn’t always end successfully. Before making a decision, here are a few things to consider. 1. Howard Dinits R(B) is a Certified Residential Specialist, and is one of the top 100 agents in Hawaii. Howard will sell your home for more money. Some 61 percent of FSBOs that sold their homes themselves to avoid paying the commission fee ended up getting less. However, the typical FSBO home sold for 18% less than an agent-assisted home. That’s $492,000 for FSBOs, compared to $600,000 for agent-assisted homes. 2. The Howard Dinits Team understands the ins and outs of the complicated Hawaii Real Estate transaction process. It is Howard’s job as your Realtor to guide and support our clients during the sale of a home. We will also help mitigate the overwhelming and time-consuming contracts, forms and disclosure statements required throughout the process. The most challenging tasks for For Sale by Owners in Maui include: staging and repairing the home for sale; getting the price right; understanding and completing paperwork; selling within the time planned; and attracting potential buyers. 3. 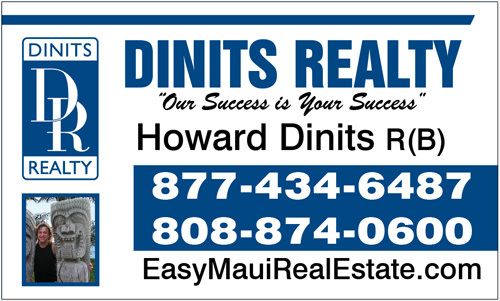 Howard Dinits CRS knows how to market your Maui Island home effectively. Getting the word out is essential for a successful and timely sale, so agent-assisted sellers benefit from frequent use of a wide array of marketing tactics. 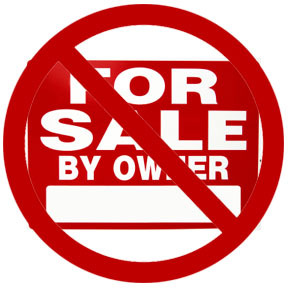 FSBOs rely mostly on yard signs, newspaper advertisements and open houses to incite buyer interest. Only 24 percent use the Internet to market their homes, while 72 percent of agents do. “The biggest challenge for FSBOs is getting enough exposure for their home,” Howard continues. “The Maui newspaper captures only 1 percent of potential buyers, the Internet captures 32 percent, and the Multiple Listing Service (MLS) captures 51 percent. 4. Howard Dinits is trained to overcome objections, negotiate and remain impartial. Selling and buying real estate is an emotional process for homeowners. When its time to negotiate price, Howard Dinits is his clients’ advocates and can compile statistics and research, balance offers and counteroffers, and handle many of the contingencies that can be frightening and frustrating for buyers and sellers working alone. 5. Howard Dinits’ clients are satisfied. Since 2005, Howard has helped 100’s of sellers on 4 islands. The majority of sellers who work with Howard Dinits believe they benefited from his experience and knowledge of the real estate market, and 99 percent report they would use Howard again or recommend Team Dinits to others. See client Success Stories here. Learn about Hawaii Real Estate commission rates here.